The 3d Window is still have bug in beta23. & I send a proof video to your mailbox. (Sorry for the low quality video).I dont wish to expose my mistakes I do in it. . Please ignore my mistake , because I am not good in internet(especially Forums also). Thanks for your tests and the video. No problem for the video quality as long as it shows the problem. For interested users, this video shows that the 3D view gets greyed also when a dialog box is opened in the program or when a tool tip of the catalog partially covers the 3D view, like in the following image. I could reproduce the second issue, but not the first one, but they are similar because actually, the 3D view gets greyed when a sub window is opened, whether this sub window is a dialog box or a tool tip. The good thing is that the 3D view returns to normal as soon as these sub windows are closed, almost all the time. I'm going to check if it can be fixed. Did you notice at least some improvements about the 3D view resizing? This time, the Beta 24 should cover also the cases reported by sree.arun.kr. The 3D view still blinks before being repainted in some cases, and sometimes, the tool tip of the catalog remains grey, but all in all, this works much better now. Hope Windows users will agree. Sorry I cannot understand the changes you made. (Can you add a picture or a video). First trial rendering with beta24 seems the gray bug fixed(by adding fast refreshing speed? ). But it does not works fine like v4.3. 1. Could you please check that the skylight and IBL light works together and gives over brightness at mid day in Arial view?. 2. At the exact time 4.04AM gives me a slighter moon light effect. I wish more light with the same sky in the scene can give exact moon light effect. 3.In a night scene by increasing the size of bulb(light),why coverage area of light reduces?. I think its a bad setting. If I add more light then it multiply shadows too. So I need a bigger light in the scene. 4. Adding self illumination glow can solve tubular/neon light effect. Is it possible?. 5. Could you please check that why temp file in folder(%AppData%\Roaming\eTeks\Sweet Home 3D\work) duplicates the plugins folder content?. It slow down application lunching. That's just what I wanted you (and others) to test. Thanks for the good news. You have to compare with the version 4.3 running under Java Web Start with Java 7/8. You probably use the installer version 4.3 which is bundled with Java 6, not Java 7/8, and Java 6 will continue to come with the installer of version 4.4. I remember that this didn't work correctly, and won't renew the tests now. As you seem to be able to modify the code, feel free to test it on your side. Sorry, I won't manage the moon, just because the night hour is convenient for the users who want to manage all their lights, without having a default light. 3. In a night scene by increasing the size of bulb(light),why coverage area of light reduces? I just tested again and didn't really see a difference of light power on a scene that contains just a light. 4. Adding self illumination glow can solve tubular/neon light effect. Is it possible? I don't see what you mean, searching "glow" in SunFlow source code gives nothing. 5. Could you please check that why temp file in folder(%AppData%\Roaming\eTeks\Sweet Home 3D\work) duplicates the plugins folder content? It's on purpose. Otherwise, it would be impossible (or much more complicate) to allow the user to import a .sh3f / .sh3t file that overwrites an existing one, without relaunching the program. If you don't want this copy to be made, select the Read only attribute on .sh3f files in %AppData%\Roaming\eTeks\Sweet Home 3D\furniture folder and on .sh3t files %AppData%\Roaming\eTeks\Sweet Home 3D\textures folder. Beta 24 does not have the greying out problem like the previous one did. As you said, it only blinks when resizing the panes and immediately repaints, so that is ok for me. I have not noticed any greying out when I hover over tools to cause the tool tip to show up. Yes, I have installer version for 4.3. And you are right the gray bug lies in java 7/8. Yet I believed that my new JRE can over ride the java6 in SH3D. Is it possible to override the java6 -installer version with new JRE/JDK by configuring launch4j.ini or any other method ?. As you seem to be able to modify the code, feel free to test it on your side. I am confused that in which line and page consist of light creation. I just want to turn Off sky light,Keep turned On IBL light and render. Just asked because from 6.PM to 4.AM( 8.Hr) screen is black. The word 'Glow' taken from 3dsMax. If the script can produce light from Vertex/point then why it can't from mesh. It would be impossible (or much more complicate) to allow the user to import a .sh3f / .sh3t file that overwrites an existing one, without relaunching the program. Wohoo. Its an unknown tip for me nice work. Can you make more sharper/high resolution images in 2D window(Top)like the 3d(bottom) does.? Is it possible to override the java6 -installer version with new JRE/JDK […] ? Simply replace the content of the jre6 subfolder of Sweet Home 3D installation folder by the content of jre7 or jre8 folders found in C:\Program files\Java. IBL is generated here and Sky light here. Sharper = higher resolution = more memory. It would be probably a good idea to add this in preferences. Be sure to post a feature request to avoid I forget it. Meanwhile you just have to set a value higher size than 128 for the canvas used to generate plan icons in PlanComponent class. Works with sun and IBL is failed .I think I need to study more about java programming with concentration. As you said I added a feature request . I would like to indicate some mistake that feels from my side. 1. Currently In virtual mode Observer angle become "Zero" when he look south.I think its a mistake because currently in positive angle(like 47/+47) value observer looks sunset. In civil/survey field positive value means observer looks sun rising.? 2. In 3d window Left top corner buttons are misplaced that means Upper arrow act as zoom in button instead of camera upwards(3rd button from top/above zoom out) and thus the others too.Camera Left and Right rotation works fine). 3. 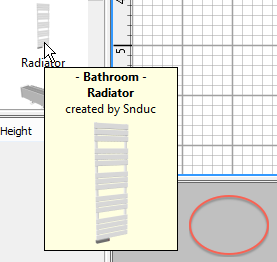 Svg exported file not working correctly.In Inkscape imported furniture and walls are placed randomly ,in illustrator a warning popup says "Item imported improperly. Clipping will be lost on roundtrip to Tiny". 4. Canvas does not need a negative value area or limit at a particular location. As the correction is a tradeoff that could alter the image quality of the 3D view (mainly on the borders of walls, furniture...), please check if it works for you. sree.arun.kr, thanks for posting the feature request. If you're sure to have found a bug in SVG export, please report a bug with a way to reproduce it, because it works on my side in Inkscape and browsers (but I don't have and won't buy Illustrator). For your information, Sweet Home 3D 4.4 was released tonight. Thanks all for your tests and support.